Inside mobile quality testing lab Jump to media player Linda Yueh has been granted rare access to a lab where mobile phones are put through various stress tests to check they meet quality standards. Charge your smartphone in 30 secs Jump to media player New technology means you could charge your empty mobile phone battery in 30 seconds. Energy-saving technology put to test Jump to media player New technology aimed at cutting power bills is being tested by some families in Milton Keynes for the energy company E.On . Complaints over mobile phone signal Jump to media player Residents of a Hampshire town have demanded better mobile phone coverage after two years of signal problems. Stuck teenager rescued from drain Jump to media player A 16-year-old girl has been rescued by fire crews after she became wedged in a drain outside her house while trying to retrieve her phone. Why does my phone think it is abroad? Jump to media player There are hotspots around the coast and borders around the UK where mobile phones pick up foreign signals. 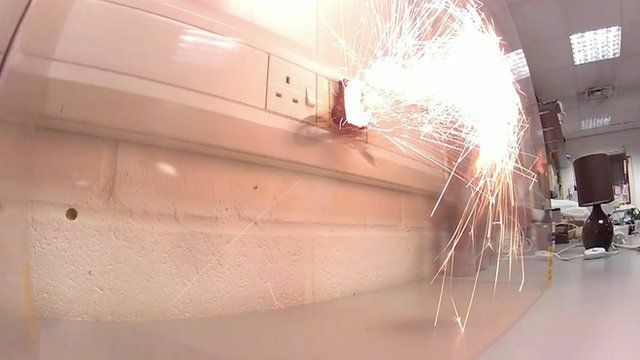 Safety experts are warning that the rise of cheap chargers for electrical items like mobile phones, laptops and even e-cigarettes could be putting people and their properties at risk. It comes after three generations of one family died in a house fire in Sheffield last month. An investigation is continuing into the blaze but the fire service says it is likely to have been caused by a faulty electrical charger.